You may not realize this as you reach for that first morning cup of coffee at your neighborhood coffeehouse in Portland, but the beans that you ground to make that cup have made an incredible journey that they make, just to help you wake up. That is, unless you happen to live on a coffee plantation in that narrow band of tropical and sub-tropical latitudes that will support the growth of coffee bushes. If instead, like the overwhelming majority of the world’s coffee consumers, you live in the temperate climates of the Northern Hemisphere, then your coffee had to go through some serious traveling to make it to your cup. The discovery of coffee has been attributed by some to an Ethiopian shepherd who noticed, several hundred years ago, that his goats “danced” after they consumed the fruit of a certain kind of shrub. 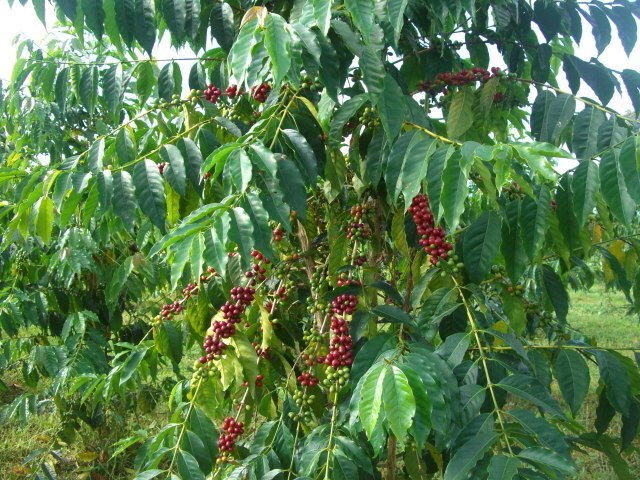 The shrubs that produce these fruits, coffee cherries, have since been exported to every corner of the globe that would support their cultivation. This, of course, has made the journey one step shorter for the individual beans that go into your cup. 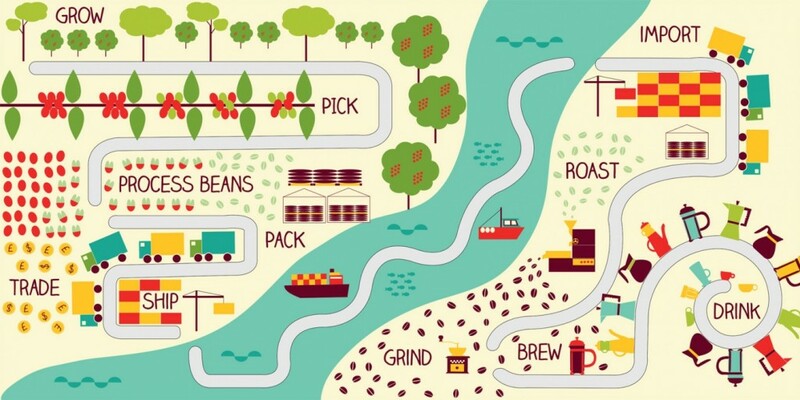 No matter where coffee is grown, it all starts in the same manner. Seedling coffee bushes are pampered for about five years until they reach maturity and begin to yield fruit. A mature coffee bush will produce around a pound of coffee, which is typically only harvested once per year. The harvest is completed by hand to ensure that only the ripe cherries are picked for processing. It is a very labor-intensive process, and this has something to do with the final price of coffee as a commodity and as an eventual consumable. 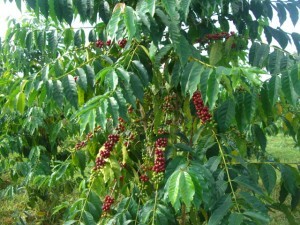 The next stage in the journey of the coffee bean between plantation and cup involves the processing of the cherries. 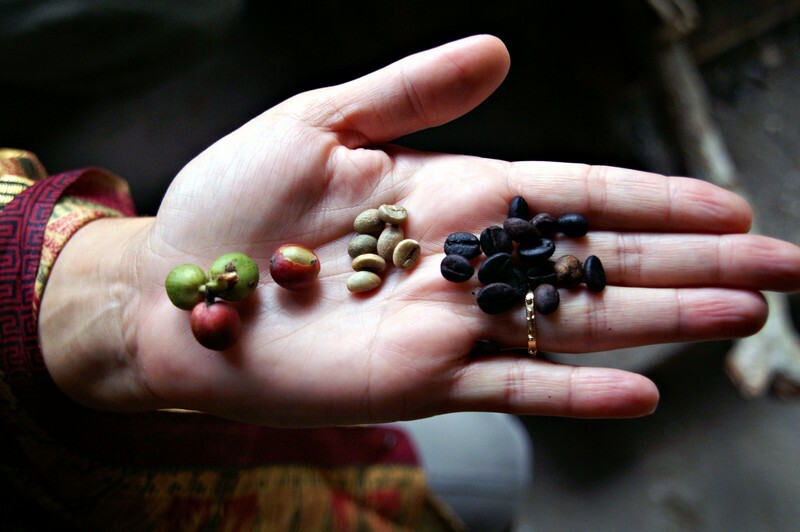 At harvest, the green coffee bean is surrounded by the pulp and husk of the coffee cherry. This must all be removed prior to preparing the beans for export. There are two methods that are currently employed to remove the husk and pulp from ripe coffee cherries: the wet method and the dry method. With the dry (or natural) method, the cherries are spread out on mats in the sun. They are raked often to ensure even drying, until the husk and pulp are dried out and easily removed by hand. With the wet (or washed) method, the coffee cherries are softened in vats of water and then processed through a machine to remove the husk and pulp. 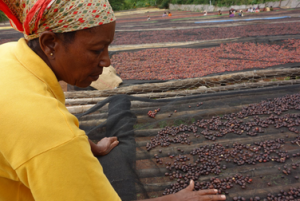 The dry method is the old way, and is often considered to be the best way of processing coffee cherries. Once the green coffee beans have been separated from the coffee cherries, they are packed in burlap bags and shipped to all corners of the globe. Coffee is traded on the commodities market, and also directly. Increasingly, direct traded coffee, with incentives for farmers like fair trade price guarantees, is becoming the norm for higher end and gourmet coffee. Most mass produced coffee is still traded on the commodities market, however. Once the coffee has been sold to a coffee company, it is shipped and processed again. At this stage, coffee can be subjected to a decaffeinating process, and then roasted, ground, flavored, and packaged prior to making its way into distribution. Once the coffee is in distribution, it is delivered to either your local retailer, restaurant, café, or espresso cart, where it may undergo the final stages of grinding and brewing, typically to order, in the case of cafés, carts, and restaurants. Or it may have to wait for you to bring it home to complete its journey in your kitchen or office.